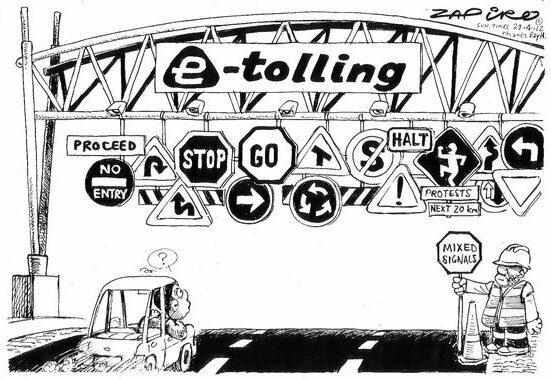 After reading Andrew Feinstein's book on the South African arms deal and how much money was wasted by corrupt ANC officials and ministers, I am not surprised by all the ducking and diving surrounding our e-toll fiasco. I recently obtained a copy of the Government Gazette (No 35263, 13 April 2012, Vol 562) that lists the actual toll fees. It is not a pretty sight. And it shows how badly SANRAL has been lying to the public. 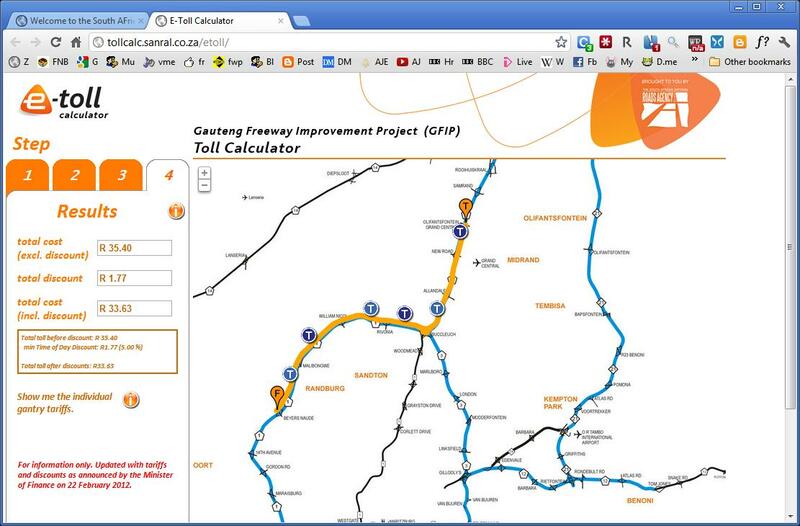 I used their "toll calculator" to work out the costs of a return trip to Dennis Polack in Midrand. I stated that I don't have an e-tag and was driving in a passenger vehicle from Beyers Naude to Olifantsfontein. The quoted price for a return trip: R33.63, including a time of day discount. In spite of their nifty little map, they lied. Page 9 of the Gazette shows 6 columns. The column that applies to me is Column 6, a non-registered user who has no e-tag. They carefully ignore this column, but rather use column 5, which is for registered users who don't have an e-tag. 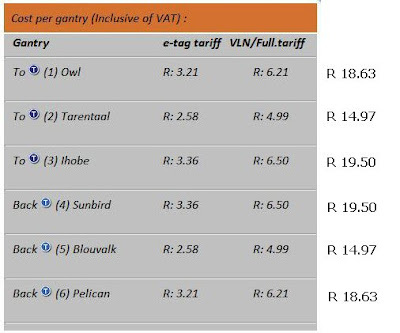 These are people who have paid in advance for their use of the roads, and have foolishly handed over their banking details to SANRAL, and agree to have the money deducted from their account whenever SANRAL decides to do so, irrespective of road usage. I'm not that much of a sucker. I've shown the actual column 6 figures above. 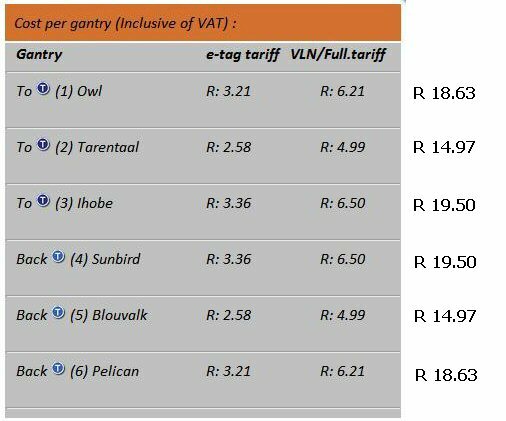 The total without discount is actually R 106.20, quite a lot more (215%) that the R33.63 they quote. I'm entitled to a discount if I pay within 7 days of driving past the toll plaza, irrespective of whether they have sent me an invoice or not. Their revised terms and conditions (after much criticism) doesn't mention what they will do if I don't register. They clearly haven't a clue. Update: I called their call centre and got a reference number 2001010574. The person who took the call tried to assure me that I would only pay R33.63. I told her to forward a recording of the call to her supervisors. I also gave them 30 days in which to fix their web site. Like they are going to listen. 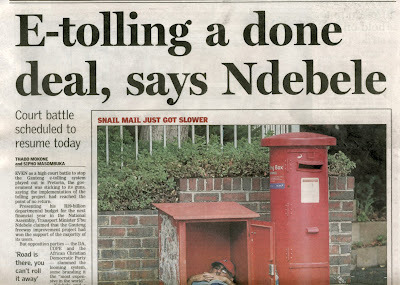 When I saw this headline (while the court case was on, Mr Idiot Minister) I knew that someone had just banked his bribe. These guys are so blatantly kleptocratic it's sickening. The ANC are completely out of touch with their own members, let alone the public at large. Update: The SANRAL CEO has "resigned". Presumably that will make him unavailable to answer questions when the court review begins. I wonder why ... ?